This is the traditional chicken masala curry made on a regular basis in my mom’s house. She makes it when there are impromptu guests for breakfast with pathiris, or for dinner with neichoru or madikki pathiri. For a long time, I had been adding variations to this recipe, but gradually gravitated away it, finally forgetting the original recipe. So it was a pleasure to get it back from my mom and start over again. This chicken curry uses most of the whole spices locally available in Kerala, which in turn gives it its unique flavour, associated widely with Malabar curries. You could omit adding more water in the end to make it a Chicken Masala (Kozhi Varatiyathu). Chicken-2 lb, (750gm) cleaned and cut into small pieces. 1. Wash the chicken and lightly toss it with lemon juice and rinse again. Drain well onto a slotted drainer. 2. Heat the oil in a large shallow pan, add the whole spices. Sauté till the fragrance fills the air and then add onions. 3. Fry onions till transparent and add chilies, ginger and garlic and stir well. Then add the tomatoes, all the spices and chicken and cook uncovered on low heat till water comes out. Do not add any water: it will prevent the spice powders from getting cooked. This will take between 10-15 minutes. Keep stirring to avoid the spices from getting stuck to the pan. 4. Add salt and the pepper. Check to see if the chicken is cooked. If there is no water, add ½ cup water and now cook it covered for five minutes to let the chicken cook well. Add ¾ water to make extra gravy and let it boil well. Add the leaves, leaving the coriander leaves for the last, after switching off the flame. Shaheen, wow! Nice presentation. Will be trying out your chicken curry recipe and also try out chicken varatiyadhu very soon(I've been looking for a Kozhi varatiyadhu recipe for very long time).... thanks a lot...Keep such recipes coming. Nice work! 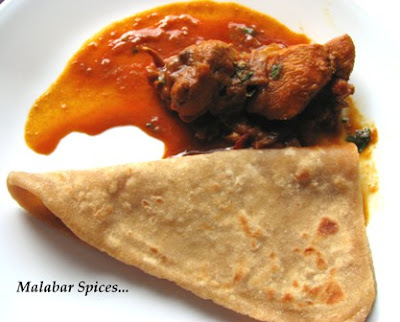 The parathas alongside the curry look yummy. Anon,Thanks for visiting my malabar cafe. Nabeela, The rotis are very simple..just like the layered roti, but less folds and triangular in shape. Very good indeed. Tried it out tonight, loved the aroma and the flavor. I tried this recipe yesterday night and it came out really good. I really like ur presentation as u put things very very clearly. Thanks a lot for the great recipe and do keep up the good work. I tired this recipe last sunday it came out very well. I usually add this chicken masala and all that store brought stuff but this time just the spices mentioned in ur recipe and no store brought stuff and the recipe turned great my hubby loved it. Have added this recipe to my favorite list. Good job Shaheen and ur presentation is really awesome. Makes my mouth water and most importantly gives me a feeling that i should try this eye catching recipe. Thanks Once again and keep continuing ur great job. God bless u.
it means a lot to me when someone cooks my recipe and comes back to let me know how it turned out.thanks you. 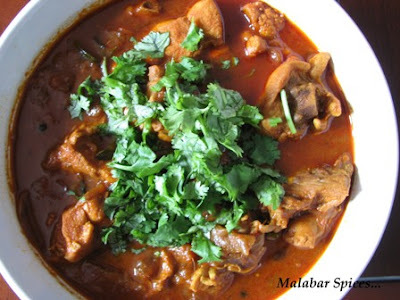 I've just made your malabar chicken curry for lunch, both my husband and me love it! Your recipe is simple to prepare, but the dish turns out so delicious! Your chicken surely will become a regular on our dinning table. Thank you so much for sharing this wonderful recipe Shaheen! GAttina:Wonderful that you like it. It is a very simple curry, but tastes awesome. i am a regular reader of your blog,and have commented in it earlier too. Your blog has helped me a loy,and i make this curry often. but such a kind of gravy,i am not able to make in bigger quantity. But speciafcally,i want to make a thick gravy without using cocunut milk. onions,ill get a thick gravy,But inspite of me frying them real well,the onions dont really mix in well,and they will be quite visible. Hi Umms, Nice to know u like this curry. This is primarily not a really big gravy curry as the gravy that is there is meant to be a little thin, not watery though.U do have add milk if you want a lot of gravy. one way you can increase quantity without adding milk is to chop 3-4 onions finely and fry 1/2 of it on very low heat. Take care not to burn the onions as it will taste bitter then. Or you could microwave it for 5 minutes. Then grind the fried onions, green chilies, garlic etc first. Then fry the rest of the onions as usual and add the ground paste and continue sauteing it. Then it disintegrates well and makes the curry thick.Also add more tomatoes and spice powders if you are increasing onions.Do try and let me know. Thanks,ill try that,and let u know. i used to initially,grind the whole onion,and make the curry,but that didnt give it a keral taste,so then i switched on to frying it as it is. ill try this method too. tried out this recipe..really good.Thanks for this recipe.Also I tried ur malabar mutton biriyani and that came out really good.gonna try more of your authentic recipes.Good job Shaheen,keep going!! tried your chicken curry.was excellent. I tried this and it came out really nice. Definitely a keeper! Thanks a ton, Shaheen, for this easy to cook delicious chicken curry recipe. I have tried many of your recipes and love them all. I wanted to know whether you use roasted coriander powder for this recipe. The curry has a such a beautiful dark color...i assume its the roasted coriander powder. I want to make this curry soon...so a feedback will be appreciated. Thanks in advance. Vandana, i do use varutha or roasted coriander powder. If you want to try it, you could dry roast the seeds in a skillet till a medium brown and then powder it finely in a dry grinder. Bought coriander powder is not the same in taste. Just made this curry for lunch today. Not only was it absolutely delicious, it looked delicious as well ! My husband says it tastes like 'hotel' chicken curry which I believe is a compliment! I just tried this recipe tonight and it was delicious. I may try it with some coconut milk the next time. It was very simple and easy. I tried your chicken curry recipe today for lunch.It came out simply good.My husband liked it very much. Thanks a lot for sharing the recipe.Keep posting!! In what ratio do you make your ginger garlic paste? if I take 100 gm ginger, how much garlic must I take? Also... about the curry leaves sprig - how many leaves approximately? Hmmm Sumptuous. Look forward for more interesting recipes. Aseem, the more curry leaves the better.. use around 10-15. As for the ginger garlic paste, i just eyeball it in equal quantities before grinding it. This recipe is wonderful..........I am a student in Germany and i cooked it for ma dinner for friends, to showcase Kerala cusine. It was a great hit. Thanks a lot for your recipe. I have cooked it as per your instructions and it tastes great! However, Don't you think that you are adding way too much of Spicy ingredients that's making this curry very hot? I mean, 6 chillies and 2 tpbs of chilli powder is a little too much for any person to handle the hotness of this curry. otherwise this recipe is a must! anon,glad that you liked the taste. by the way, its not 2 tbsp, its 2 tsp...teaspoon of chili powder. please read carefully. For a whole chicken(2 pounds) this much is not too much as the chili powder varies in heat, but feel free to reduce it as you like. the important thing in cooking is customizing to your taste.. this is just a template. I tried ur recipe and it came out superb and I was amazed at the simplicity of the ingredients! When do I add the curry leaves?